Nairobi doesn’t have the best reputation when it comes to crime. But safety in Nairobi is actually a matter of following a few simple rules. The city centre is crowded with askari’s (guards) and most upmarket hotels and apartment blocks have fences and guards around them. This also goes for hotels, resorts etc. elsewhere in the country. Most city inhabitants hate criminals just like you, and will help you to keep safe. In fact, when a pickpocket steals something from you, be careful to yell “Thief!” or something, because it happens all too often that bystanders will grab the thief and molest him at the spot. When in doubt, ask people in your hotel, in shops etc. how to keep safety in Nairobi – they will give you honest advice. Safety in Nairobi: take taxis at night. 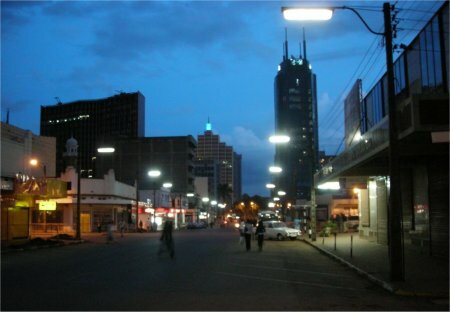 This is a typical Nairobi street scene after dark. Don’t go in deserted areas alone. If you stay among the general public, you’ll be fine. The only thing you’ll encounter then during the daytime is the occasional conman with some far-fetched story. One trick is that they say they recognize you from the hotel or any other place, and you are too polite too raise doubts. Another type of conman impresses you with suit and tie and a lot of knowledge about your country, and may tell a story about how they will study at a university in your town (they do a lot of research! ), but need to borrow some money for the flight. They are more amusing than threatening. Just don’t go with them, and don’t give him any money. If they follow you while you’ve made clear that you want to be left alone, threaten that you’ll call the police. If you feel you want to do something for the people there, better donate through an established organization than handing money to beggars etc. Or just have another great vacation in Kenya – tourism brings in 1 billion dollars annually in Kenya, and this isn’t charity but simply payment for good services provided. The same goes for beggars, although there are much less of them than most tourists would expect. It’s dark early in Nairobi – around 7 PM. If you go out after dark, take taxis. Matatus (private minibuses on specific tracks) are safe during the day, but there have been cases where matatus have been robbed or abducted (with the driver being forced to go to a deserted place). You shouldn’t go into the slums without the company of locals who know the place and can guarantee your safety. People are poor and desperate there. But as a tourist you’ll see nothing of the slums unless you go looking for them. It’s interesting to see, though.